Property Search Sell your home Mary has closed over 2,380 properties and helped thousands of clients make their dream of Buying or Selling real estate a reality. Sign Up to Add Favorites, Save Searches & Receive Listing Updates via Email! Mary's passion for real estate and helping others is evident through her completely unique, personalized experience that she strives to provide each client. Mary understands that selling, buying, or leasing real estate can be incredibly stressful and that is why she and her team work diligently to ensure a helping hand and resources are available throughout the entire process. Mary also understands that there is no one size fits all approach to meeting clients needs and therefore goes above and beyond to fully understand each client's situation. Mary has been the #1 Realtor in Oak Lawn since 2008! Mary's knowledge of the southwest suburbs and Chicagoland is unparalleled. Mary has been actively involved in the community and served as an elected Oak Lawn Park District Commissioner for 12 years, as well as the President. Mary worked diligently and persistently to make Oak Lawn's first dog park, "Bailey's Crossing," a reality in 2011. Mary also served as a counselor at Oak Lawn Family Services. Mary graduated with a Bachelor's Degree in Psychology from Southern Illinois University in Carbondale at the age of 20. Mary then went onto complete her Master's Degree in Community Counseling from Saint Xavier University in Chicago. Mary's energy is without equivalent and exceeding her client's expectations has always been her #1 priority. Mary has been a Realtor since 2003, each year achieving higher levels of success. Mary is licensed in both Illinois and Wisconsin. 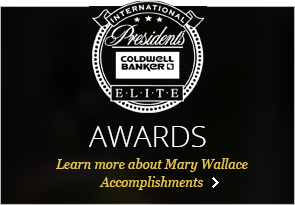 In 2017, Mary was recognized as the #1 Realtor in Coldwell Banker Residential Brokerage North America for closing 243.8 sales in 2017. Mary has also risen to the ranks of the Real Trends top Realtors' list as advertised in the Wall Street Journal, ranking 29th Realtor in the United States and #1 in Illinois in the America's Best list for closing 243.8 properties in 2017. Mary was featured on the cover of Realtor Magazine in 2007 as a recipient of the 30 Under 30 Award. In 2018, Mary was awarded the "Industry MVP" in the Suburbs for Chicago Agent Magazine's Agent's Choice Award. Mary is so grateful to God to have found her passion at 20 years old. She has had the pleasure or working with and getting to know thousands of clients throughout the years. Playing a role in such an important part of their life has been very rewarding. Mary's tagline is "Client Centered, Results Driven" because what is best for the client is always the #1 consideration and getting them the best results possible is always the goal. Mary has closed over 2,380 properties and helped her treasured clients make their dream of buying, selling, leasing and investing in real estate a reality. So please, have a look around, and contact us with any questions you might have about the market or our services. We are always happy to help! Why choose the Mary Wallace Real Estate Group? Mary has been the #1 Realtor in Oak Lawn since 2008. Mary's knowledge of the area is unparalleled and she provides high level negotiation skills to help clients get as much as possible for their properties. Since 2013, Mary closed over 1,079 properties since 2013 and has helped hundreds of clients make their dream of buying or selling real estate a reality.